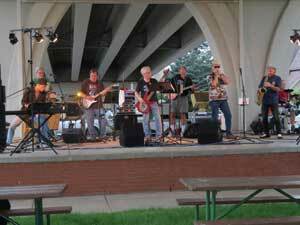 Are you ready to hear some blues on the Root River Trail? Stop in at the Whalan Stand Still Parade on Saturday, May 19, in Whalan, Minn. The Stand Still Parade festivities begin at 10 a.m. and continue until 3 p.m. The parade will stand still from 11–12 noon. There will be musical performances throughout the day, including The RavensFire Band, Wellespring, and the Lanesboro High School band. But, hold on to your hats, because starting at noon the Rutabaga Brothers take the main stage with their brand of the rockin’ blues. The Stand Still Parade in the village of Whalan is the band’s kick-off performance for the 2018 season. When the parade stops standing still, get ready for the rockin’ blues of the Rutabaga Brothers. The Rutabaga Brothers is an eight-piece ensemble formed in 2011 and features some of Southeast Minnesota’s most seasoned musicians. Band members include: Damon Prestemon – keyboard, vocals; David Harrenstein – bass, keyboard, vocals; Craig Johnson – percussion, Gary Marcoux – guitar, John Gaddo – percussion, bass, keyboard; Keith Zeller – guitar, vocals; Lee Loerch – harmonica, Nathan Davidson – saxophone. Come to the festivities starting at 10 a.m. and stick around to get a dose of the blues at this year’s Stand Still Parade — Saturday, May 19 in Whalan, Minn.